Today was supposed to be the first snow of the season. Because it's daylight savings and now dark at 2 in the afternoon (not really, but it feels like it) I have no idea if it actually did snow today BUT there's these dudes. The yearly Cheeky Snowballs. 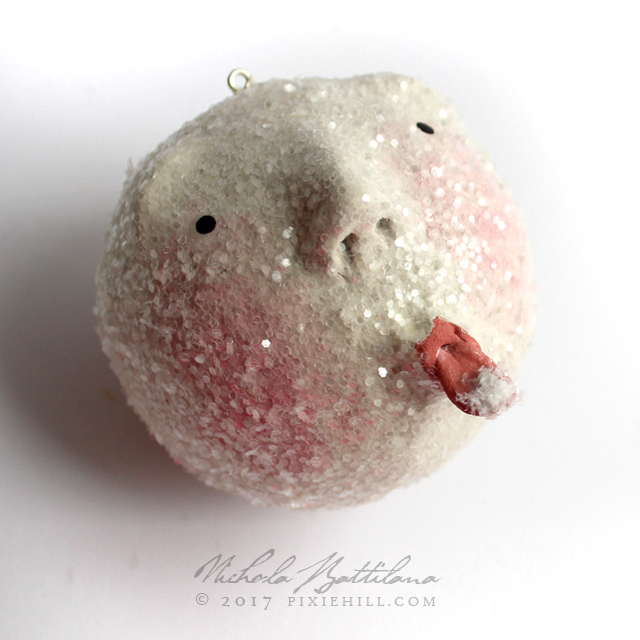 I've been making these guys for nearly 10 years. TEN FREAKING YEARS! 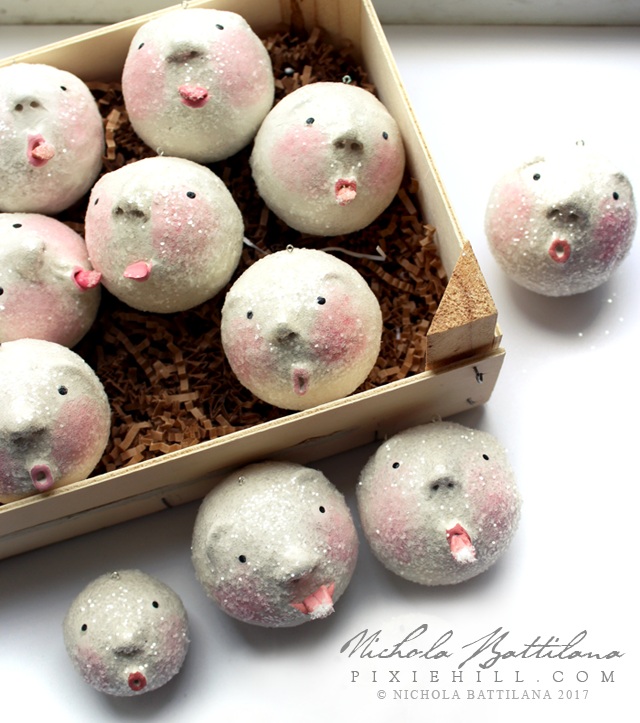 They started out as emotional snowballs and transformed into the cheeky variety. 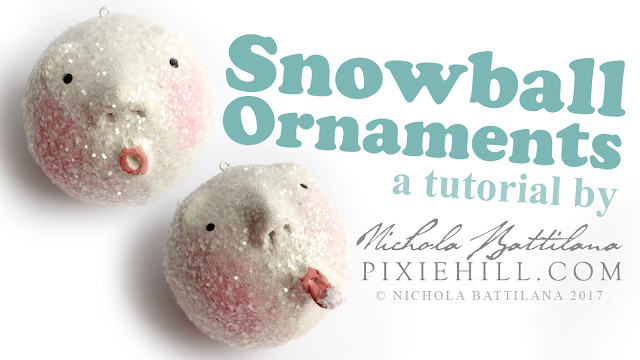 This year I've decided to do a tutorial so people can create their own. The video is available HERE on my YouTube channel. If you create your own, please share on social media and tag me. Seriously, it's appreciated and I totally want to see what you make. A couple of things I KNOW are going to come up. 1. Can I use a different clay? I REALLY recommend you use Creative Paperclay for this project. It's super light weight so your ornament won't drag down the Xmas tree branches. It gives a beautiful finish. There may be a bit of a learning curve if you're used to other materials... but In my opinion it's absolutely worth $ and time. 2. It's taking SOOO LONG! Can I speed up the drying? I prefer to let things dry naturally. There seems to be less warping, and cracking when I let things take their course. Plus, do you really want to put styrofoam in the oven? Nah. What is most important is that your glitter of choice is NOT SOLID WHITE. The flecks in this product are transparent. This is important. You want a product that will allow the underlying paint colour to show through. Just look for something transparent or translucent. 4. I can't find tiny eye hooks! 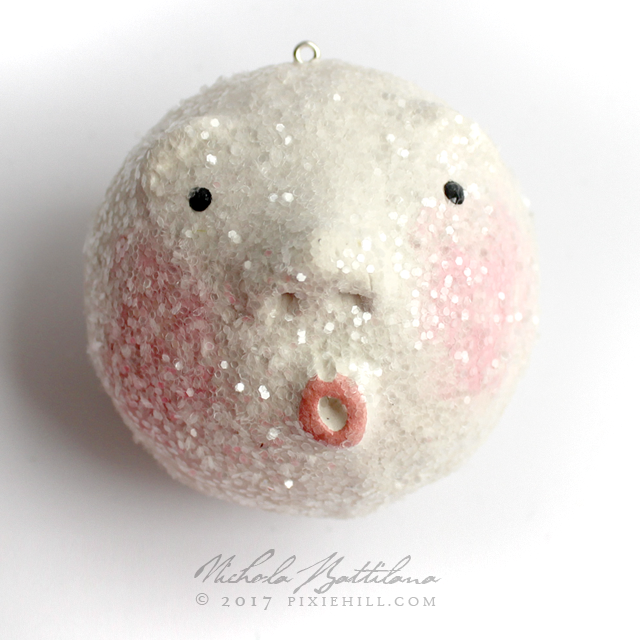 I use teeny tiny eye hooks for hanging on my snowballs. If you can't find any small enough, try the jewellry section of the craft store and look for findings like these Tiny Silver Eye Pins*. Poke a hole with a straight pin, add a dab of glue, and slide it in. They'll work in a pinch. 5. What kind of glue do you use? I'm using Elmer's School Glue in the tutorial. The better the quality glue you use (i.e. 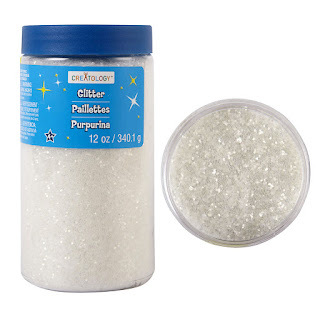 Aleene's Tacky Glue) the more glitter will remain on your snowballs in the long run. 6. Can I (insert other subsitution/method/madness)? Part of the joy of creating is experimentation. Have an idea? Give it a try! Maybe it'll turn out a bazillion times better than my snow dudes! NOW GO AND MAKE DEM BALLS! Thank you Thank you Thank you!! for the tutorial, just love your snow guys!! Love these! Thanks so much for sharing how to make them! thanks so much for the tutorial. I love these!